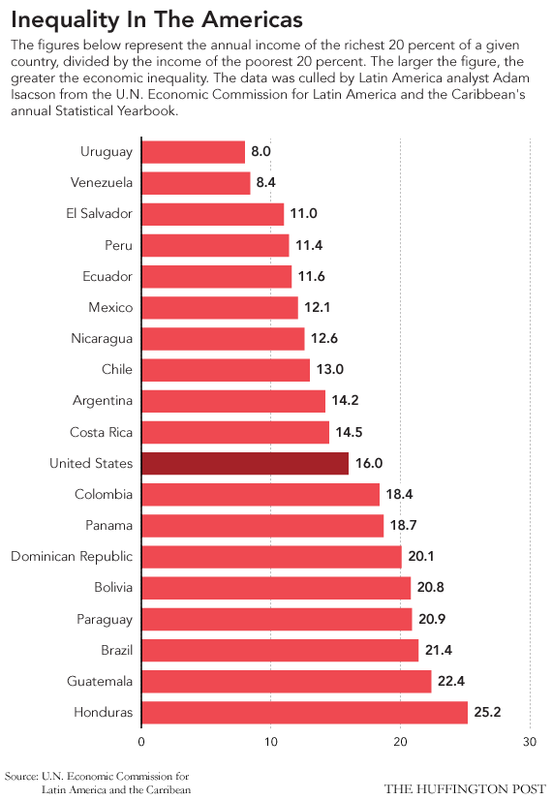 Latin America has long been viewed as a region plagued by some of the worst wealth inequality in the world. But in recent years, those figures have turned around, while in the United States income inequality is on the rise. The United States (wealthiest 20% earns 16 times more than the poorest 20%) is now in the middle of the pack. In 1980, the U.S. number was 10.5. Uruguay -- whose famously humble president José “Pepe Mujica donates 90 percent of his salary to charity -- ranks as the most equitable country in Latin America, with the wealthiest 20 percent brining in 8 times more than the poorest 20 percent. Venezuela comes in at number two. The United States takes eleventh place -- behind Costa Rica and ahead of Colombia, and several spots below its southern neighbor Mexico. Advances in Latin America played a role in the trend. Wealth inequality has dropped throughout the region over the last decade, due to advances in education and successful social spending programs targeted at the poor, according to the Economist. More than 50 million people joined the ranks of the middle class in Latin America over the last 15 years, according to a World Bank study published in November. That marked the first time on record since the region’s middle class growth outpaced population growth for the poor. Wage inequality for women in Latin America has diminished to a level comparable to that of the United States, according to ABC News/Univision. Meanwhile, in the United States, income inequality is on the rise, as working class and middle class salaries fail to keep up with those of people at the top of the income pyramid. The share of income for the top 1 percent in the United States has grown more than any other Western country since 1960, according a paper by Thomas Piketty of the Paris School of Economists and Emmanuel Saez of the University of California at Berkeley published last year.